LC-2 Lambda Cable (Standalone Wideband Controller) with wideband 02 Sensor and our famous tiny square display that mounts anywhere with velcro. Comes with everything you need even the weld on bung. WideBand Display for innovate Controllers. 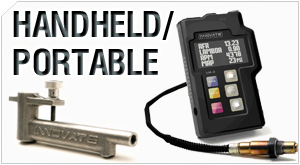 This gauge will display the air fuel ratio from the wideband innovate controller LM-2 and LC-2 models. Its very small and sticks anywhere. size of a key chain remote. This square Air/Fuel ratio wideband monitor is a low cost solution for folks looking to remote monitor thier air/fuel ratio with the innovate LC-2 or LM-2 wideband controllers. LC-2 Wideband Air/Fuel Ratio Controller with wideband o2 sensor. This kit is only the controller and does not include a display. You can use it for fuel injection systems or datalog your o2. The HBX-1 is intended to provide a degree of thermal isolation in applications where the pipe temperature exceeds 900 � F (approx. 500� C) with a heat-sinking design intended to screw into a new or existing 18mm bung. Exhaust Clamp Patent-pending, Venturi-effect, tapped exhaust clamp for obtaining accurate lambda measurements in non-cat autos or other engines.